Steampunk Magazine » SteamPunk Magazine, Issue #5 Released! 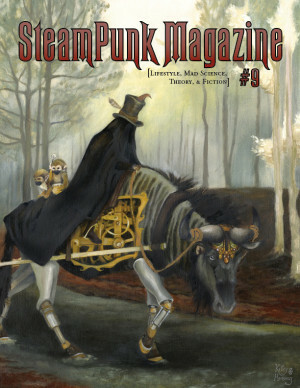 SteamPunk Magazine, Issue #5 Released! Some people said it would never happen, for a moment in there some of us even thought it would never happen, but now, over a year since the release of our last issue, it brings me immense pleasure to announce that the fifth issue of SteamPunk Magazine is now available! Featuring everything from emergency welding to a very special guest essay by Bruce Sterling, it is available for download on our downloads page, and can also be purchased, as ever, through Strangers in a Tangled Wilderness. In other news, some of us here at SPM will be heading up to Whitby Goth Weekend in two weeks time where Abney Park are playing. If you’re planning on being in the area, drop us a line. We’d love to see you there. It’s absolutely fabulous! Well done, all! I might be at Whitby but I need a PLAN. you guys got boingboinged. i assume that’s why i’m having so much trouble dl’ing the imposed pdf… right? standard wordpress theme?….you guys seriously need to steampunk this website! with all the changes happening, are the people that had free subscriptions since they were in prison still going to get them? i was just wondering because my mom is really looking forward to this issue. Good to see the new issue, but I have to ask, where did G.D. Falksen’s An Unfortunate Engagement go? I was looking forward to that. Hell yeah, gentlemen! Top notch issue! To Isaac: Yes, we have every intention of continuing to offer prisoners of the state free subscriptions. However, we don’t actually keep track of it, so you need to request it each time. Luke: I enjoyed Falksen’s serial quite a bit as well. Back when I was going to have been the editor for issue #5, I was planning on scaling back from the fiction and was shying away from a no-end-in-sight serialized novel (instead continuing Reppion’s 3 part novelette, for example). Falksen does have another serial in The Willows, another fine steampunk publication, and I was under the impression he’d found a home for An Unfortunate Engagement, but I might be mistaken.